Say what you will about social media but if it wasn't for Facebook, Scotties Pixie and Dixie would not be where they are today. Two years ago, we shared a post from Flathead County Animal Shelter in Kalispell, Montana on the Scottie Mom Facebook page. Within a short while, hundreds had commented and shared in hopes of finding a safe and loving home for this bonded pair who had been surrendered to the shelter along with a chocolate Labrador Retriever and Jack Russell Terrier. That's when Scottie Mom Michele stepped forward. 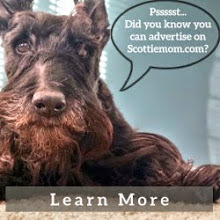 "I didn’t belong to any Scottie rescue group pages, only the Scottie Mom page," Michele told us in an email. "I saw the picture of Pixie and Dixie and felt so sorry for them, sitting in the shelter and waiting for a home. I began to wonder if it was a crazy idea to adopt them. Then, I Googled how far it was from Reno, Nevada to Kalispell - which is almost at the Canadian border. There were flights to Kalispell from Reno but because it was June, the summer animal travel embargo was in effect so they couldn’t fly home with me." After getting a hold of the team at Flathead County Animal Shelter who agreed to hold Pixie and Dixie long enough for her to make the journey north, Scottie Mom Michele booked a flight and made reservations to rent a car for the 1,028 mile (or 14.5 hour) journey home. "When I landed in Montana, it was pouring rain," Scottie Mom Michele said. "I got my car, set the navigation system and headed for the shelter. The people there went back to get both the girls and brought them out to me but they were very skittish (and very overweight – they each weighed about 30 pounds and they are little dogs). I was so happy to meet them! They were just scared. I walked them to the car and they jumped into the back seat and off we went." Remember Scotties Pixie and Dixie in Montana? 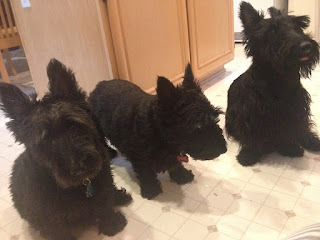 They met their new Scottie Mom today! Hip-hip-ArRRoO for happy tales and happy tails!! A quick stop at Petsmart and the trio went to check in at a nearby hotel for the evening. That's when I received the following message from Scottie Mom Michele via Facebook. 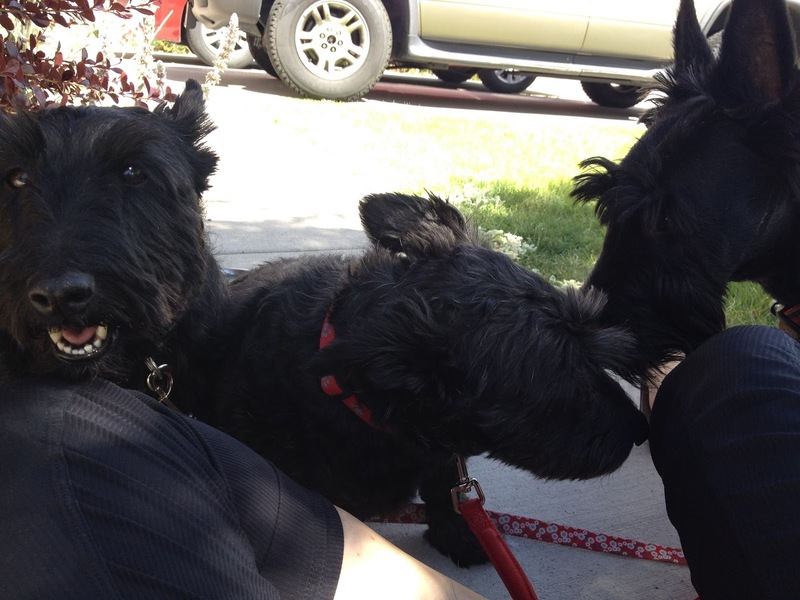 "They are very timid, but I have already gotten a Scottie kiss from one of them," Scottie Mom Michele said. "These two little girls don't even respond to their names. They are extremely shy and are hanging out under the desk in the hotel room. They are great car riders, which will come in handy as we make the 1000 mile trek back to Reno." The next morning, Scottie Mom Michele woke up to see both girls standing with their front paws on the bed - seemingly ready for the day's adventures! They journeyed eight hours to Twin Falls, Idaho where they spent their second night together in another hotel. That's when I received another Facebook message from Michele. "A quick update on today's travels with Pixie and Dixie," Scottie Mom Michele wrote. "They are such good little travelers and so sweet, they sleep practically the entire time they are in the car but are ready to get out and walk as soon as I stop. They didn't eat anything last night, but today they are drinking plenty of water and have eaten a little. I can already see that they are warming up!" At home in Reno, Pixie and Dixie finally got to meet the family including their new Scottie brother, Puck, known to be extremely social and very loving to other dogs. Pixie smiling for the camera while Dixie says hello to Puck. 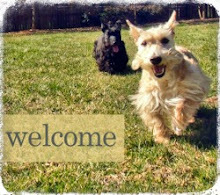 "It was a leap of faith to adopt two dogs who I had not had a meet-and-greet with but I knew we could give them a forever home, lots of love, and that everything would turn out fine," Scottie Mom Michele said. "I love walking in the door at the end of the day, to be greeted by all three, with wagging tails and kisses." Nearly two years later, Pixie and Dixie are down to 24 pounds each. 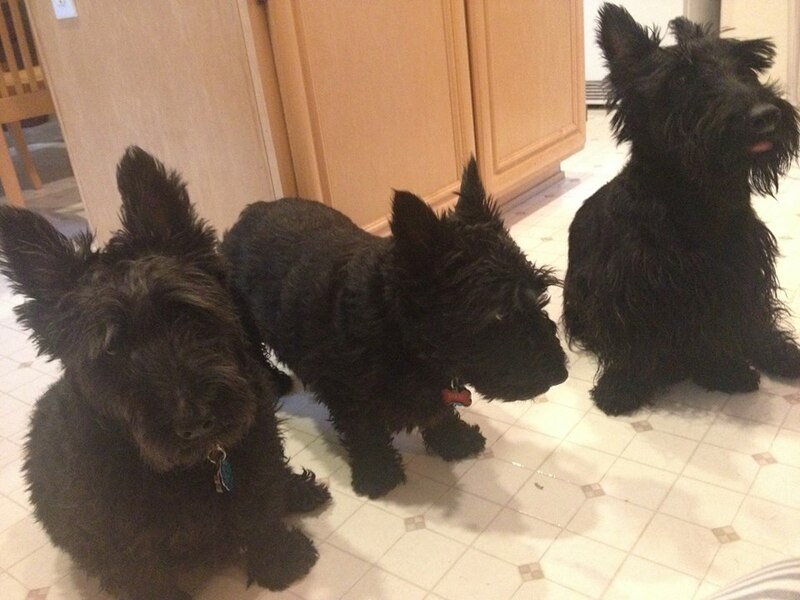 They go for long walks twice per day with their Scottie Dad and love to play and run around with Puck. Their personalities have begun to shine through and they aren't afraid to snuggle up with the humans whenever they please. In December, Dixie had knee surgery requiring eight weeks of rehabilitation. She has recovered nicely. I know Michele personally, and I am a former Scottie Mom myself, so it was a real treat to read this story. As I have known since the moment we met, you are such a loving, giving person. Wonderful story and photos! What an amazing and inspiring story. You are so correct about giving them plenty of time to adjust and to trust their new family. Its a learning experience for the entire family. Watching them blossom into the loving, confident Scot that they all are, is priceless. 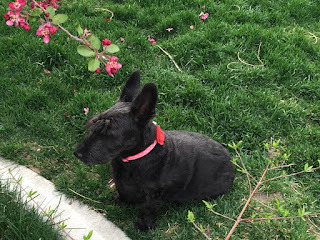 We got Kali (Scottie mix) who was in a kill shelter at one time and "on the list". She was adopted before and turned back in after a weekend because she was too wild. Two years later, she's still energetic but a great dog and full of love. The "give them time" advice is absolutely the best. It took each of our rescue boys about 12+ months to settle down and relax. And then their awesome personalities shone through! 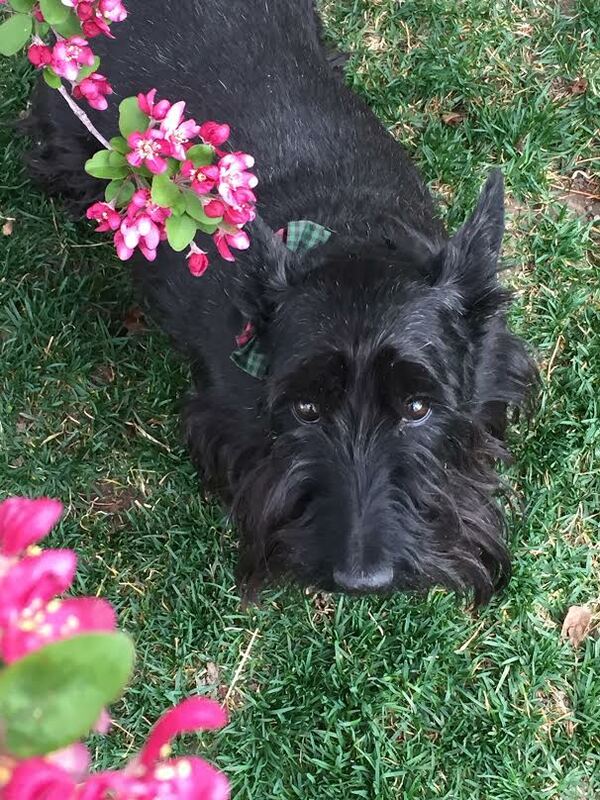 WE just adopted a rescue scottie from not so far away New Hampshire. I can't imagine why anyone would give up these wonderful dogs. Thank you for the beautiful story. I've had rescues and they are the best dogs. I thought maybe I was getting a new bro and sis this past week. Two Scotties went up for rescue in Cincinnati. Even though we had a vet reference who has known Lee for 29 years, a dog trainer from Petsmart reference and our Reader Dog reference people we still got turned down. The two got separated which broke our hearts. We are sad. Oh no! It is so sad to see binded pairs separated. I'm sorry to hear you were turned down. Your human sounds like a pretty amazing pet owner to me, Sweet William!